Author(s): Alina Maria Holban. Microbiology Immunology Department, Faculty of Biology, University of Bucharest, 1-3 Portocalelor Lane, Sector 5, 77206 Bucharest, Romania. In recent years, severe infections caused by the Gram positive pathogen Staphylococcus aureus have emerged both in community and clinical settings. The increased infection rates are explained by the versatility and resistance of this pathogen, which produces a wide arsenal of virulence factors, organize within difficult to eradicate biofilms and displays various resistance genes, leading current antibiotic therapies ineffective. Nanotechnological progress highlights the impact of magnetic nanoparticles in the current and future diagnosis and therapy procedures of the infectious diseases. These nanostructures could be used as efficient carriers for many natural and synthetic antimicrobials, which may be further utilized for the development of soluble anti-Staphylococcal formulations and improved surfaces and coatings of different uses, optimized to reduce attachment and biofilm formation. Keywords: Biofilms, Magnetic nanoparticles, Novel antimicrobials, Resistant pathogens, Staphylococcus aureus, Virulence. Affiliation:Microbiology Immunology Department, Faculty of Biology, University of Bucharest, 1-3 Portocalelor Lane, Sector 5, 77206 Bucharest, Romania. Keywords:Biofilms, Magnetic nanoparticles, Novel antimicrobials, Resistant pathogens, Staphylococcus aureus, Virulence. Abstract:In recent years, severe infections caused by the Gram positive pathogen Staphylococcus aureus have emerged both in community and clinical settings. The increased infection rates are explained by the versatility and resistance of this pathogen, which produces a wide arsenal of virulence factors, organize within difficult to eradicate biofilms and displays various resistance genes, leading current antibiotic therapies ineffective. Nanotechnological progress highlights the impact of magnetic nanoparticles in the current and future diagnosis and therapy procedures of the infectious diseases. 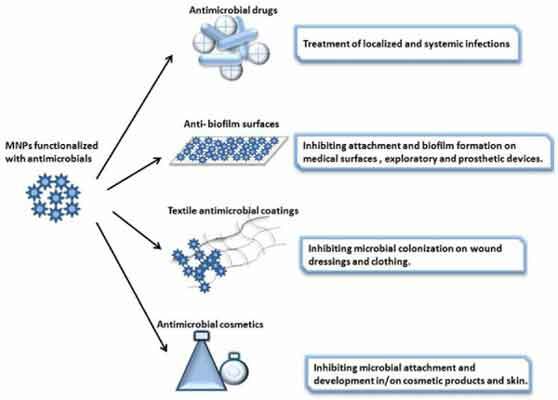 These nanostructures could be used as efficient carriers for many natural and synthetic antimicrobials, which may be further utilized for the development of soluble anti-Staphylococcal formulations and improved surfaces and coatings of different uses, optimized to reduce attachment and biofilm formation.